Is it the desire to be different? Today is an amazing day and we will remember it for years to come no matter if you participate or not.Come on, cheer up a little! Not that much to celebrate in Nigeria Sandrine..
All that I saw in Sao Tome (from the net) is available within Nigeria, but only in relic populations in scattered patches - which are facing extinction. As you say, the inability of Nigeria to get its act together (on anything), has seen yet another opportunity slip. Jeremy, I'm afraid you are sadly mistaken. I see a lot of cynicism and uncalled for pessimism here. The truth is that 5 or 10 years ago Nigerian tourism was an unspeakable dream, people would laugh at the concept. At least now there´s a tourism master plan, the private sector is involved, and the sector is set to take off imminently with the revision of the visa regime, hotel rating, and establishment of tour operators and packages. The Cross River initiative should be an example of more things to come in the way of Nigerian tourism. Sure, Sao Tome has the small island charm, Gabon is tourism friendly, etc. Nigeria will ultimately capture most West Africa bound tourists. It´s just a matter of time before democracy stablizes and some sort of sense in the management arrives, just like what happened in the telecom and banking industry, and recently, airlines. I went to sao tome last year from lagos and it is a great place to visit. V different to nigeria with a real caribbean island feel. Beautiful calm, clear waters to swim and scuba dive in and some v interesting old historical plantations to visit. 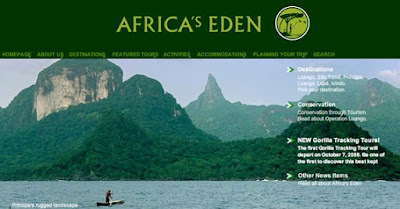 Nigeria has a looong way to go to promote tourism. If you want a really nice beach resort you have to go all the way to casa del papa in benin republic as no one seems able to set one up near lagos. It's crazy really as casa is always full of nigerians. Sandrine, if you are located in Nigeria and you are privy to some of the violence that has taken place in the last few days, especially the one against the woman in Victoria Island, I doubt it if you will be celebrating a victory in America. I beg go ahead celebrate and let Jeremy do as he wishes. He is probably thinking that woman the that was beaten up could be his wife or any of the other women in his life. If I were him, I would be worried. Believe me you there's is not much to celebrate. But if some people want to celebrate let them. he is not stopping you. I live in Miami and I had no idea that there was violence going on in Naija right now.I assumed that the crime that happened in Victoria Island was isolated. Jeremy,I do apologize for being unsensitive. On the other hand,Ola,if you would live here in the States,you would understand why this is so important for us and why we are celebrating.You are right though,we should just keep to ourselves. I hope it will get better in Naija. It is precisely because of people like you that Nigerian tourism is a failure. You yourself must be convinced your country has something to offer. Otherwise, we'll get there without you. Will take more time yes but it's ACHIEVABLE. Admirable confidence, but facts are facts. People who go on eco-tourism holidays want as much of it as they can possibly experience. They want the environment to be as pristine as possible. Nigeria with an environment, best described as poor. Can't hope to compete with the countries of Central Africa, who have managed to preserve much of their natural heritage. Cross River state (beautiful as it is) is hampered by the antics of pirates operating unrestrained off the coast and militants who are free to do as they wish in the Niger Delta. International media attention focused on their activities have effectively dealt tourism there a serious blow. Sandrine, you should celebrate. You have every right to celebrate. An historic event has happened in your country that is worthy of celebration. The violence against women in Nigeria has become a national sports. Recently, an army beats a young woman to pulp and that did not make headline news; a young girl was gang raped and too many atrocities to mention. All in the last few days. I must admit when I saw the video of the young woman, even though she was very defiant, it really dampened my spirit. I had to really struggle to allow the Obama euphora to settle. But it is not easy knowing that that could be me. Anon 8.19 I think Nigeria has a lot of tourism potential. Like everything else in the country, a POTENTIAL. daily violence, especially one against women is a reality in Nigeria. You better face that fact.